The chapel was founded in 1880 by Rev. William Rees and built here in 1881. It opened on 6th February 1881, though was incomplete, and could seat 600. It cost about £900 to build. The land was given by Mrs. Finch – a local publican who had felt sympathy for Rev. William Rees having been locked out of his own chapel at Yr Hen Gapel/Capel Isaf, Llechryd, and forced to resign because of his unpopular views on temperance. A surprise religious census in 1884 showed 183 attending in the morning and 228 in the evening – making Tabernacl the best attended place of worship in the parish. On 6th August 1889 Annie Reees, the only daughter of Rev. William Rees, Minister of Tabernacl, died aged 16. In 1918 Rev. William Rees retired as Minister. On 14th January 1919 Rev. William Rees died. 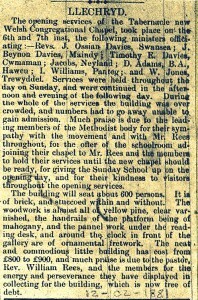 In March 1920 a plaque in memory of Rev. William Rees was unveiled here. On 22nd December 1920 Rev. Daniel Adams became the Minister. In 1920-50 Rev. Daniel Adams was the minister. In June 1937 tenders were sought for painting and decorating the interior. In June 1938 Rev. & Mrs. Daniel Adams celebrated their golden wedding anniversary. 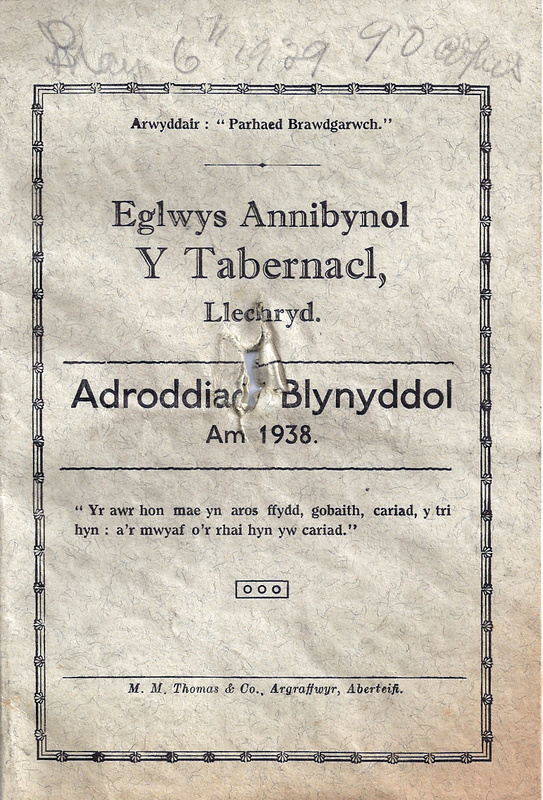 In 1938 the Deacons were named as: David James, Llwynduris, Llandygwydd; John Davies, Clifton House, William H. Sallis, Milestone; Griffith Jones, Olmarch; Richard Evans, Glanderi, Cilgerran; David Davies, Lanhurst; Griffith Jones, Cwrcoed; Enos George, Llwyn Duris; William J. Williams, Boncath; and Benjamin Thomas, Glanarberth. On 30th November 1950 Rev. Daniel Adams retired after 30 years as Minister. In 1952 the Deacons were: William H. Sallis, Milestone; David Davies, Lanhurst; Richard Evans, Glanderi; William J. Williams, Boncath and Benjamin Thomas of Glanarberth. In October 1953 Rev. D. Rhys Thomas became the Minister until 1976. In October 1975 Rev. D. Rhys Thomas announced his intention to retire in September 1976. There was then a gap without a regular minister until about 1990. 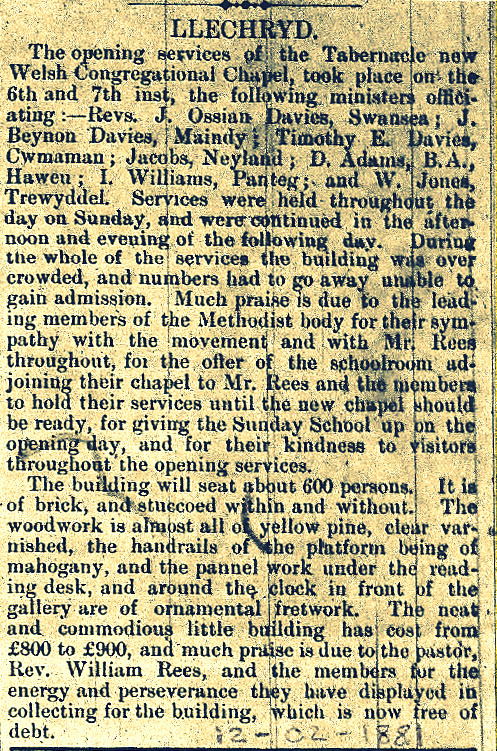 On 15th April 1981 the chapel celebrated its centenary. In 1983 the Deacons were: Harri Evans, Awelfor, Penparc, Llangoedmor; W. J. Evans, Dolwen; Cadifor Griffiths, Ceibwr; Ifor Howells, Mount Pleasant [died in 1983]; David T. Mathews, Brynawel; Ronwy Sallis, Milestone; and Ieuan James, Haulfryn, Adpar. In 1992-2005 Rev. Islwyn Selby was the Minister. In 1992-97 Harru Evams, W. J. Evans, David T. Matthews, Ronwy Sallis, Ieuan James and Alun Williams were the Deacons. All bar W. J. Evans were still Deacons in 2003-05. The chapel closed in 2010. In 2013 there were plans to convert the building into a dwelling. 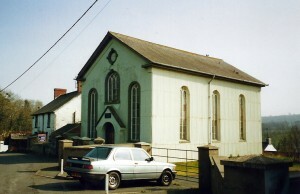 Gable fronted Independent chapel of 1881 with 3-bay painted stucco façade and corrugated sheet 3-window sides, single storey. Pitched slate roof with terracotta ridge. Façade has slightly projecting stucco gable-fronted porch with arched entrance and deeply recessed doors, corniced sides with slate roof over. Above is arched headed light with small panes and intersecting glazing bars to head. Stone sill and painted, raised stucco surround with keystone. To gable is vent roundel with keystones to compass points and raised stucco surround. Outer bays have matching tall arch-headed lights, bipartite with traceried heads and bisecting vertical glazing bars. Raised stucco surrounds and stone sills. Raised stucco eaves band, with eaves boards of side walls continuing around angles. Side walls have similar tall bisected arch headed lights and boxed eaves. Castell Malgwyn, Andrew Lester 2000. Diddorol iawn am y clou mas. O ran diddordeb roedd gan William a Nellie grwt o’r enw Eben yn byw yn Sunderland. Dwi wedi bod yn darllen gohebiaeth helaeth anfonwyd gan Rees Llechryd at Niclas y Glais (Parch T. E. N icholas) yn y Llyfrgell Genedlaethol NLW MS 13694A/95D yn ystod 1911. Diolch yn fawr iawn am y gwybodaith. Rwy’n siwr fydd diddordeb ynddo i pobl sy’n edrych mewn I hanes y capel a’r teulu. Glen. Ni fu y Parch Arthur Evans Williams yn weinidog ar y Tabernacl. 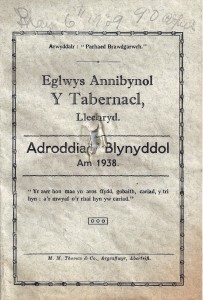 Ar ol ymddeol roedd y Parch D R Thomas yn dal i ofalu am y Tabernacl. Mae’n ddrwg gen i! Diolch yn fawr am eich help. Rwy wedi newid yr erthygl a thynnu mas enw Parch Evans Williams. Mae’n drist iawn bod y capel wedi cau. Glen.